Here at Digitom we believe that practical experience is one of the most important aspects of career development. This Summer we welcomed Kelly-Anne, a second year Media Production student from Bournemouth University, for a two week placement. We asked her to blog about her time with us; here’s her experience. As a part of my degree I am required to carry out a minimum of 20-day’s work placement within the media industry. I decided to split this placement into two, and did ten day’s work experience with two different production companies so I could compare companies in the same industry through the experience I gained from them. When I complete my degree next year I would like to pursue a career as a Producer/Production Manager. As a Runner I was able to shadow Digitom’s Founder & Creative Director Tom Chown for the two weeks, learning how he runs the company with the team of shooting directors and graphic designers. On my first day we travelled from Tunbridge Wells up to Milton Keynes to film a promotional video for global car wash manufacturer IMO Car Wash. I was an extra pair of hands, helping the Director and DOP (Director of Photography) Marcus, to set-up the equipment, learning about the cameras and lenses. Marcus and Tom explained their storyboard for the video to me, and I had the opportunity to give my input. Back in the studio I sat in on the team’s conference calls with clients and contributors on that and other productions. The thing I found of most interest within the office environment, was understanding the accounting and budgeting side of productions. 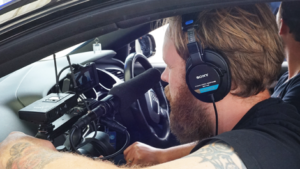 This included recording daily spend on location, such as petrol, lunches, refreshments etc. and making sure the expenditure tallies with the job’s agreed budget. In addition I learned about the importance of the formality of paying invoices, wages and taxes, and reconciling payments from clients. At University, budgeting and money isn’t something we deal with; equipment is provided, production crew work for free and shoot expenses (lunch and travel) come out of our own pockets. However, in my personal life I have a strict budget and enjoy managing my own finances. It’s encouraging to learn that financial management is a key part of the Producer role. 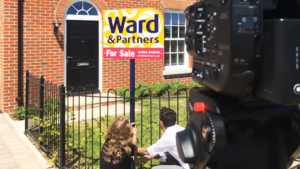 I really enjoy photography, so when the team were shooting a TV commercial for Ward & Partners. I was given the office camera and asked to gather a few behind the scenes photos. My strength is nature and landscapes, so this challenged me to learn the art of capturing people and the moments of camera-reportage. Shadowing in the edit suite I was able to watch the edit come together on the IMO Car Wash film. I found it very useful to see the process from production into post-production. Editing isn’t something I have previously been interested in, but Tom shared his knowledge with me, helping me to understand that it’s not as frustrating and difficult as I originally thought. Over the course of the two days I helped to pick appropriate music, give my thoughts on certain shot sequences, and learned that the way the crew had filmed the story helped to make the edit an efficient and straight forward process; something we don’t often see at University. Towards the end of my first week we travelled to Chichester and Portsmouth to produce a new internal communication programme for the supermarket Sainsbury’s. Filming on location in a couple of their stores I assisted with setting up the camera lights, whilst Tom took the time to explain about the importance of good lighting; taking me through the various strength of lights, which isn’t something I’ve done before. I found it useful to learn and get a clearer understanding, resulting in me using the reflector with a couple of contributors. On my second week of placement I attended two day’s filming in Pluckley and London for Nextdoor, a new online community platform recently launched in the UK. As well as assisting with transporting the equipment I was also asked to collate release forms from all our contributors. Finally, on my last day I joined the team on another location shoot at the Kent Press & Broadcast Awards in Canterbury, assisting Camera Operator Kieran to film the ceremony. I have found my ten days with Digitom very insightful and enjoyable, having been made to feel welcome within the business. I have gained a better understanding of the aspects to running a media company; including the administration/accounting side of the business, alongside the production and delivery of video content. The experience has confirmed I am doing the right degree and learning the correct skills to enter the media industry. I look forward to starting my third year at Bournemouth University and embarking upon my career.